I received a revelation (?). “Thou shall make another KFC (Korean Fried Chicken), nevertheless it shall be spicy…”. It was a still small voice that came from my hungry stomach, ha ha ha! I had posted a non-spicy version of KFC and this is a sequel episode. Chicken is our global protein source. Some people don’t eat pork and some don’t eat beef for their religious belief. Some people don’t eat fish nor seafood because they are not used to, and some don’t eat tofu because they just can’t stand it. Everyone in this planet eat chicken at least 2-3 times a week I bet.., except those who are vegetarians, or those who witnessed the murdering of chicken. I sometimes wonder if our chickens ever realize how popular they are in this world. 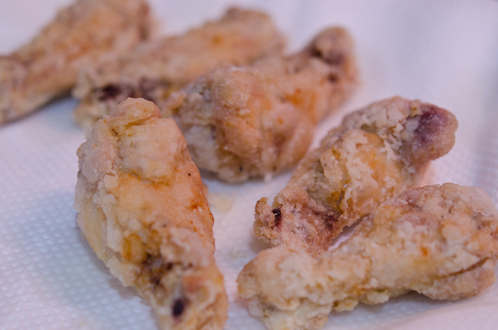 Anyhow, Koreans love their chicken fried just like Col. Sanders in Kentucky did in his. 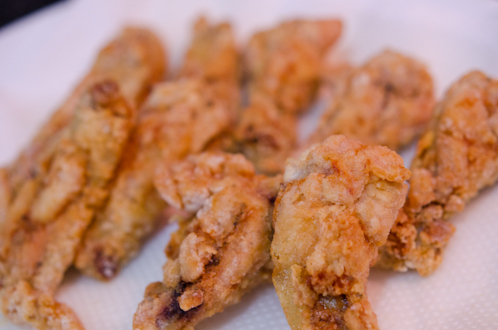 This spicy fried chicken is one of our favorite, and it will make you lick your fingers off! It is not overly spicy either for your sake. Then, of course, you can hide a tablespoon of cayenne chili powder in the sauce to knock off your husband’s buddies who come over for Superbowl game and claims your brand new HD flat screen TV as if their own. This step is totally optional and depends on your preference. I would remove the skin of these wings since they will enter to my family’s stomach. Season your lovely chicken with some ginger, rice wine, salt and pepper. Set aside. 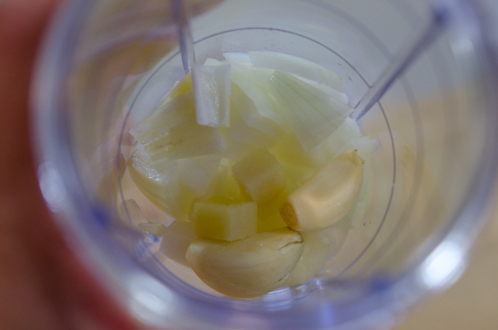 In a blender combine onion, ginger, garlic. Spin their lives together until smooth. This is strawberry preservative. Apricot is another good option. 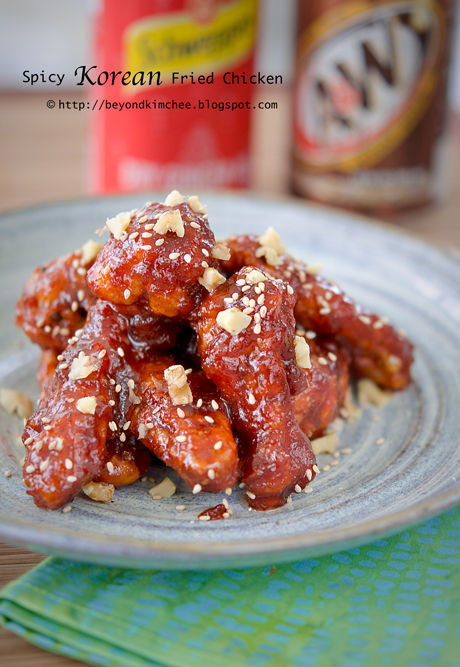 Yes, I know…, it is quite a random thing to add in Korean chicken recipe, but trust me. I know what I am doing. Combine them all together in a sauce pan. You might want to smash the strawberry chunks if there are any. 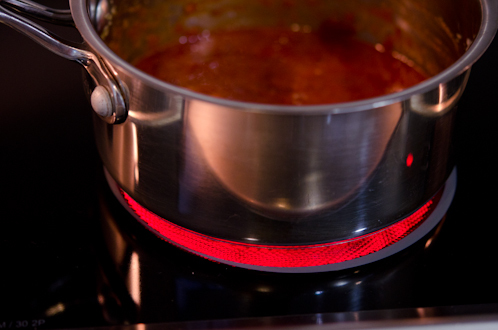 and simmer for 3-4 minutes over low heat stirring occasionally until it gets slightly thicken. Taste the sauce! You will so madly fall in love that you will want to drizzle on your ice cream. Go back to your lonely chicken. Put them in a Ziploc bag with some corn starch. 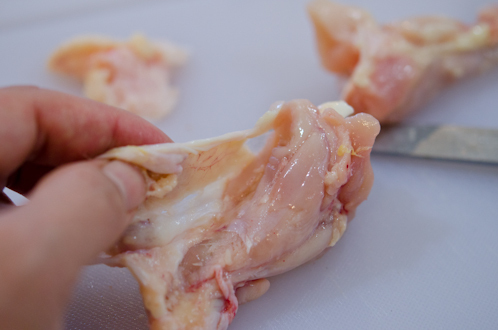 Drop your chicken in a hot frying oil and cook for 3-5 minutes. I like to deep fry twice. After first frying, the color is somewhat unappealing and less crunch. Put them back in the hot oil and fry again for the second time, about 2-3 minutes. After second frying. This is what we call NGB; nice golden brown. 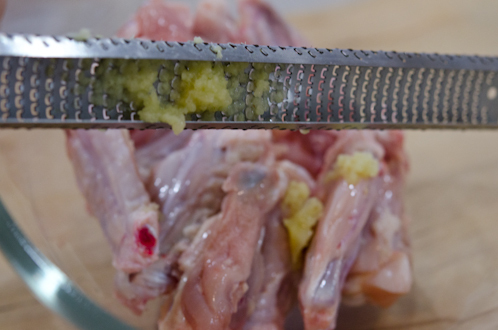 Smother the fried chicken with the sauce. Just toss them around in a pot. 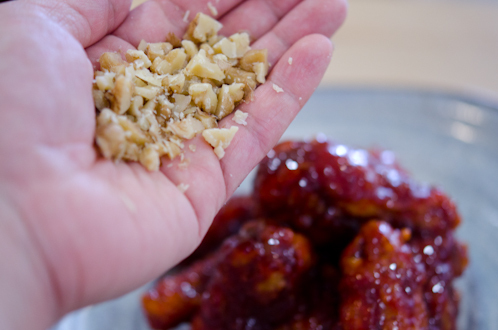 Sprinkle some nuts of your choice as garnish. I used walnuts and sesame seeds. Almonds, peanuts, pine nuts are good options, too. So make sure your fingers are religiously clean to be worth of licking. “je ne sais quoi” that no one can guess. I still can’t decide which one I like better. Season chicken pieces with rice wine, ginger, salt and pepper. Set aside. 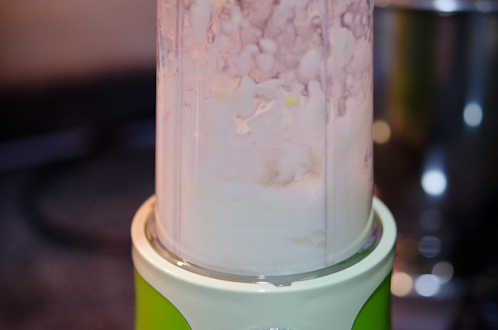 In a small blender or processor, puree onion, garlic, ginger together until smooth. 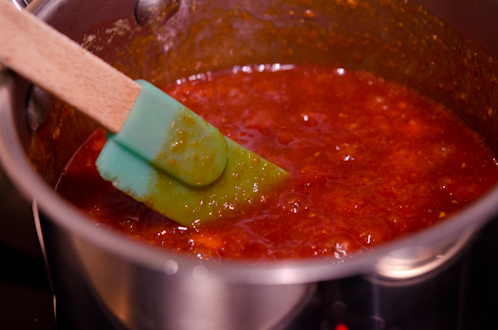 In a saucepan, pour the onion puree and add the rest of sauce ingredients, mix well. You might need to smash the chunks of strawberries, if there are any, with the back of a spoon. 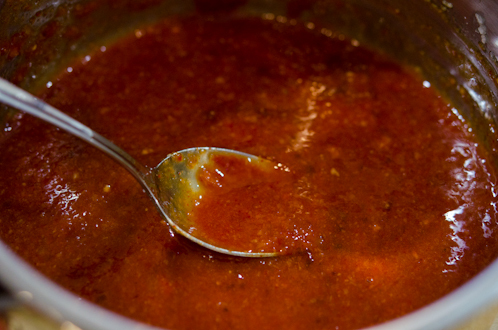 Bring the pot of sauce over medium heat and boil, reduce the heat to low and simmer for 3-4 minutes until it gets thicken slightly. Set aside. 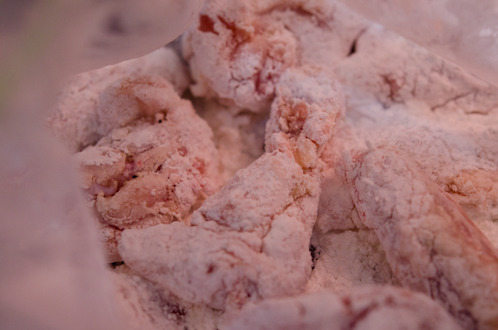 Place the chickens in a ziplock bag and add cornstarch. 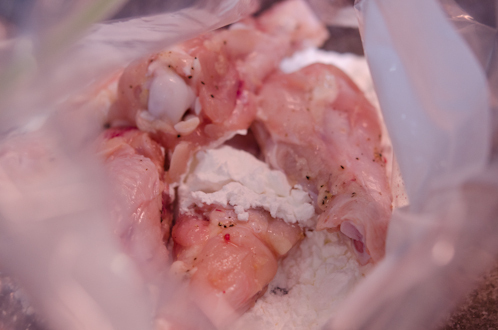 Shake the bag well to coat the chicken thoroughly. Heat oil in a heavy skillet until it reaches 170-180 degree. Drop the chicken and fry for 3-5 minutes until it gets lightly golden. Take them out and place on a plate with paper towel. When all the chicken pieces are fried, go back to the first batch and fry for second time, about 2-3 minutes or until they get nicely golden brown. OH my goodness....it is 8 am...and I want to go make these little lovelies...RIGHT NOW!!! I can't wait to try them!!! Thank you for sharing! These look so sticky and good! Can't wait to give them a try! 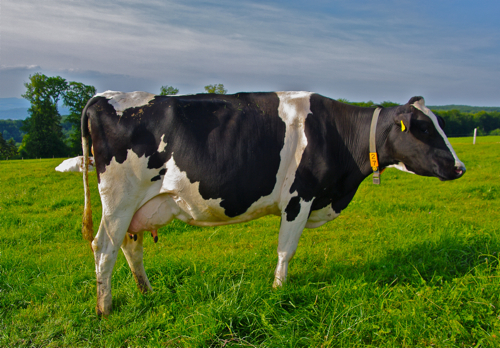 That photo of the cow is gorgeous. I loveeee photos of cattle for some reason. BUT your chicken looks great!!! I'm going to give your recipe a go! Thanks for sharing. Thanks ReNee. They are good and hope you can give it a try. Thanks for the compliment, Lindsey. They are on the sticky side but the sauce is so finger licking good. Thanks Joanne. They are indeed good. this looks excellent. 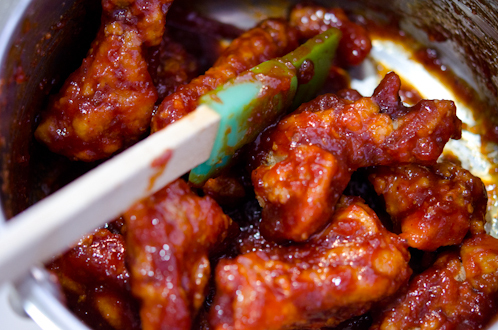 will have to try it, but where on earth did you find chicken that looks so tender and rich in Hong Kong? the supermarkets we go to (taste, and one i can't remember the name of in Tai Koo's Cityplaza) have horrible stiff chicken! Luckily I live in Malaysia now that I can access kampong chicken here. I remember chicken was not that flavorful nor tender in HK. Look for organic chicken in Oliver's or Great at pacific place. Make mine extra spicy, please. 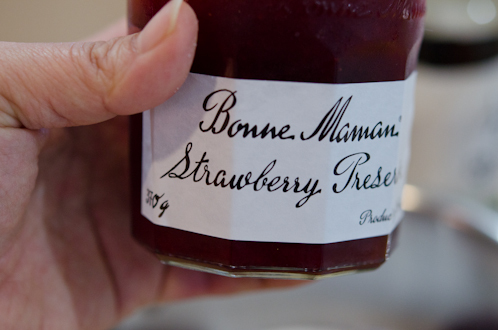 Nice recipe - I love the strawberry preserves. It does sound a little strange at first, but mentally tasting it, it seems like a perfect fit. An interesting version might be to substitute some maple syrup for the preserves, and substitute dark soy sauce for the lighter (maple syrup and dark soy sauce are a great combo, I've recently learned). Anyway, thanks for this. Alcohol and pork is forbidden. This particular recipe is for chicken so you shouldn't have a problem. 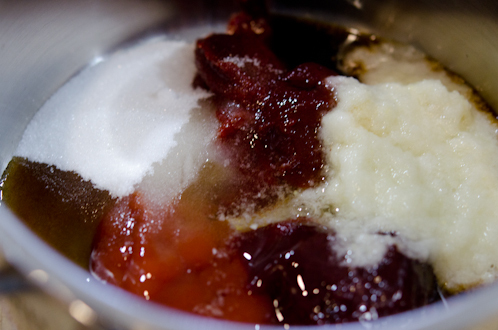 You can omit the rice wine in most Korean dishes. For the pork dishes, if the pork is the main ingredient, there is nothing you can do about it except I often suggest with other types of meat for those who can't have pork. You can find rice cakes in most Korean grocery stores these days either fresh or frozen. I like the maple syrup idea. Thanks for suggesting the dark soy sauce with maple syrup combination. That will make quite nice glaze. Thanks Faye. I like KL and I am happy to know there are some people in KL who like my blog. I made the sauce tonight with baked chicken and it was so delicious!! 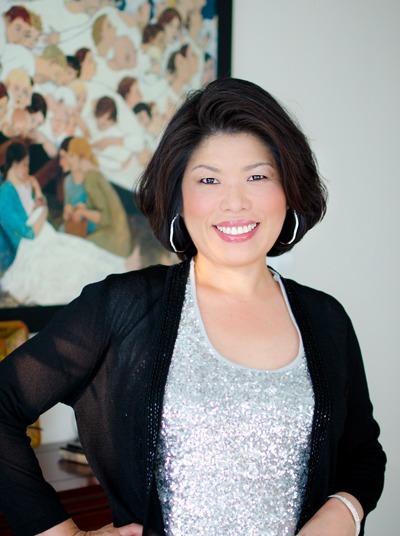 Thank you so much for this recipe, it will be great to keep this up my sleeve for parties and entertaining! Thanks Mandy. I glad that you tried with baked chicken. It will be healthier option and still delicious. I tripled this recipe for dinner tonight. As we sat down to eat, by picky 12-year old daughter said, with disgust, "I don't like chicken wings." I insisted that she take at least one bite, and then she proceeded to eat more than 10 wings, sucking all of the sauce from the bones and asking if there was any extra sauce. "These are the BEST chicken wings I've ever had!!" she said. Between the 7 of us, we finished all but a few of the 6 lbs of wings. I just have enough for my lunch tomorrow. Now I can't wait to try your other KFC recipe! 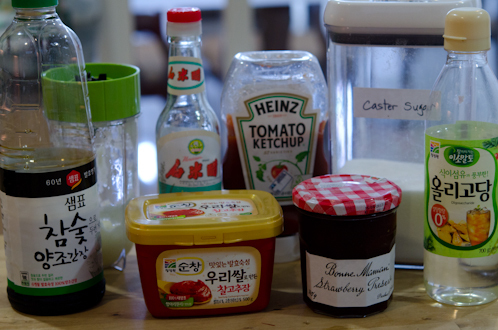 after checking few of your recipes i realize koreans frequently used rice wine. i have a bit of problem about that since i'm a muslim. so is there anything that i can used to replace rice wine? The alcohol in the rice wine is subtle and will be evaporated during cooking, but you can leave it out if it not accepted to your diet. It won't change the flavor that much. I tried the recipe last night, and it was finger licking good! It's spicy and sweet, and I just love it. But I don't used the rice wine, and I don't think there's a problem. Thanks to you my dinner overwhelmed with joy :) Oh, one thing, If I want it to be more spicy, what should I add? This sounds good and would like to make it! 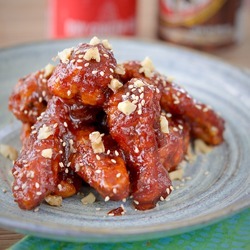 Is there another ingredient that I can use to substitute the Korean chili paste? I have Asian grocery stores in my town but none carry the Korean chili paste. Hi Xue Unfortunately the Korean chili paste is the most important ingredient in this recipe, therefore I can't recommend any substitute. Sorry! Tried the sauce with shrimp today - really good! Love the idea of adding strawberry jam! Genius! You can skip the corn syrup. It is used to add a little lust. I have been using your recipe for KFC for ages now, and just wanted to say that it is the BEST! My partner even thinks it is better than any KFC he has had before (in restaurants)! We are travelling to KL in July and were wondering (albeit a very strange request) if you knew of any good places that have KFC over there? Hi Bianca, I've seen one restaurant near Ampang point called kokodak (꼬꼬닭) but haven't tried. Thanks for the comment. I am so glad that you and your partner loved my recipe. I just wanted to say KAMSAHAMNIDA because this has been a big success with my husband and his friend. I'm French and I live in Japan and my husband is Korean. Apart from pulgogi my sister-in-law gave me the recipe for, I didn't have many recipes in my "Korean" bag. 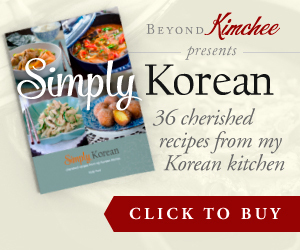 I can't eat spicy or maybe just kimchee but I wanted to find a recipe that my husband would like and spicier than what I usually do. This was excellent according to him ;) I had to buy some more chicken wings for the next day as there was some left over sauce and he wanted to have it again. That's how I know he's not lying lol By the way I also tried the tofu and egg pudding + the pan fried Korean tofu and those too were a hit. Thank you so much!! Now off to pick a new recipe to try tonight for my friends! 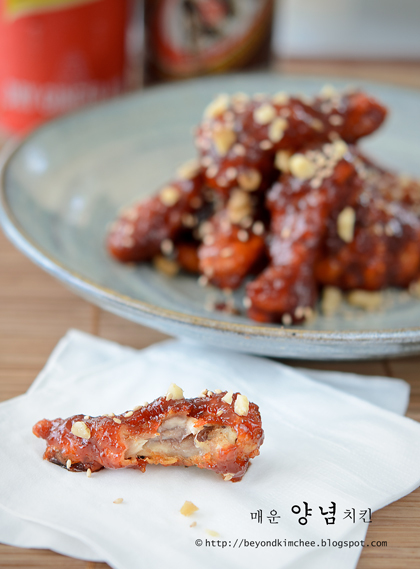 I just found your blog tonight, looking for Korean wings! I am in the US so am wondering if the frying temp is Farenheit or Centigrade? I SOOO want to make these but don't want to screw up your recipe without having some clarification. Please advise, ASAP! The temperature is Celsius. Farenheit would be 350 degree.